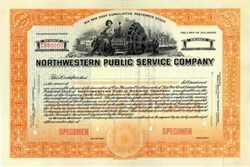 Beautifully engraved SPECIMEN certificate from the Northwestern Public Service Company. This historic document was printed by the Republic Banknote Company in the 1920's and has an ornate border around it with a vignette of an allegorical woman by a generator. NorthWestern Corporation, a FORTUNE 500 company, is a leading provider of services and solutions to more than 2 million customers across America in the energy and communications sectors. NorthWestern�s partner businesses include NorthWestern Energy, a provider of electricity, natural gas and related services to customers in Montana, South Dakota and Nebraska; Expanets, a leading mid-market provider of networked communications solutions and services in the United States; and Blue Dot, a nationwide provider of heating, ventilation, air conditioning and related services.